Last year, our brave group of fundraisers took on this epic abseil down the UK’s tallest sculpture, the Arcelormittal Orbit at the Olympic Park raising over £10,000! Abseil for the Animals is now back by popular demand so sign up now to secure your place! You have decided you would like to take on the ArelorMittal Orbit abseil for Mayhew. Great! Please see below for details on signing up. 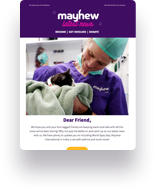 Mayhew provides help and support to neglected, unwanted and abandoned animals as well as vulnerable pet owners, including the elderly, the homeless and their pets. More than just a rehoming centre, Mayhew focus on education, preventative work and community engagement both in London and overseas through our International program. As an animal shelter, we receive no government funding so the support of our amazing fundraisers is vital. We hope you will join our pawsome community of animal lovers! Please note, you will need to arrive at least 45 minutes before your allocated time slot to allow time for registration and kitting up. Would you like to share with us why you have chosen to take on the abseil for Mayhew?